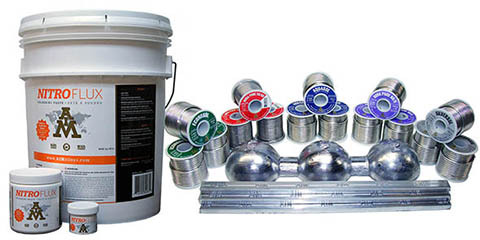 AIM offers high quality and high purity solder and Lead products specifically formulated and developed for the Plumbing industry. Standard grade lead-free high purity alloy, comprised of 97% Tin and 3% Copper. Complies with the Canadian Plumbing & Boiler codes, the Canadian Lead-free Solder standard, and the United States Environmental Protection Agency’s 2014 Lead-Free Safe Drinking Water Act. Standard grade Silver bearing high purity lead-free alloy. Complies with the Canadian Plumbing & Boiler codes, the Canadian Lead-free Solder standard, and the United States Environmental Protection Agency’s 2014 Lead-Free Safe Drinking Water Act. Premium grade high Silver bearing high purity lead-free alloy. Complies with the Canadian Plumbing & Boiler codes, the Canadian Lead-free Solder standard, and the United States Environmental Protection Agency’s 2014 Lead-Free Safe Drinking Water Act. Premium grade lead-free high purity alloy, comprised of Silver, Nickel, Copper, Tin and Antimony. Ideal for high gap filling. Melting temp range 232-240° C.
High purity lead-free alloy comprised of 95% Tin and 5% Antimony. Complies with the Canadian Plumbing & Boiler codes, the Canadian Lead-free Solder standard, and the United States Environmental Protection Agency’s 2014 Lead-Free Safe Drinking Water Act. High purity alloy comprised of 50% Tin and 50% Lead. For DWV and non-potable water application. Not suitable for potable water application where the use of Leaded solder is prohibited. A lead-free plumbing soldering paste flux, compatible with all lead-free and common soft solders, ideal for Lead-free brass soldering applications.